Coupon savings are all about seeing a deal, and making a meal. 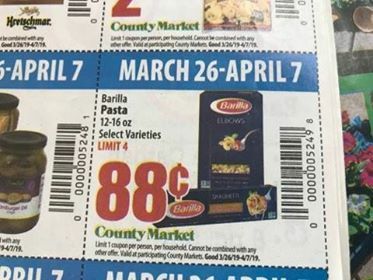 That's why you will see a two week run of the County Market coupon booklet. It is designed to allow all coupon shoppers, either the weekly or bi-weekly shopper an opportunity to redeem those meal inspiring products. 1. Farmland Bacon. On sale for $3.79 you get a full 16 oz package of bacon. Yes, FULL. Many brand bacon packages are less than 16 oz. Here you get one pound to use for any bacon inspired meal. Chicken carbonara, with a matching Penny Pincher from Barilla pasta for only $.88, or Brinner with Essential Everyday crescent rolls $1.29 and Ore Ida frozen potatoes for $1.99 and you've got two good meals. 2. Navel Oranges. In the Penny Pincher book you get 3 lb for $1.99. Oranges go great in salads. Fix a fresh spring salad with sale priced chicken, and tossed navel oranges. Add a bit of Land O Frost lunch meat for $1.79, and sprinkle in some Kraft shredded cheese for only $1.59. 3. Barilla Pasta. You can pick among many types of pasta for only $.88 each. Penne and Kraft cheese make an excellent pasta bake, or toss an angel hair pasta noodle into a skillet for a quick and easy produce sale led skillet dinner. There is a limit of 4 on Barilla. This would be a good time to LOOK ahead to the next two week Penny Pincher window and plan out your next pasta based meals like, $1.99 Johnsonville spicy sausage and pasta skillet, or combo with Philadelphia cream cheese for $1.49 and bake your pasta dish with a creamy sauce with PP Grape tomatoes for $1.49, sale priced peppers and mushrooms. One of the very best ways to save money, is to utilize the meal planning created inside the Penny Pincher coupon booklet each month at County Market.